Isolated beaches, crashing waves, the sun melting into darkness behind the trees, sharing it all with that special someone... blech, who needs it? It's that contemporary cynicism that tends to creep up this time of year. In fact that eye-rolling reflex is a pretty similar feeling to the contemporary aversion to classical landscapes. Romance and representation are so over. Except, when Liz Markus paints a sunset, dripping with luscious romance, (and we mean dripping), it doesn't look contrived or overdone. It actually looks pretty cool, like a hot, messy love affair in paint form. Liz Markus' new collection, entitled "The Look Of Love", channels the bygone glory of fin-de-siecle art with a dash of pop culture. 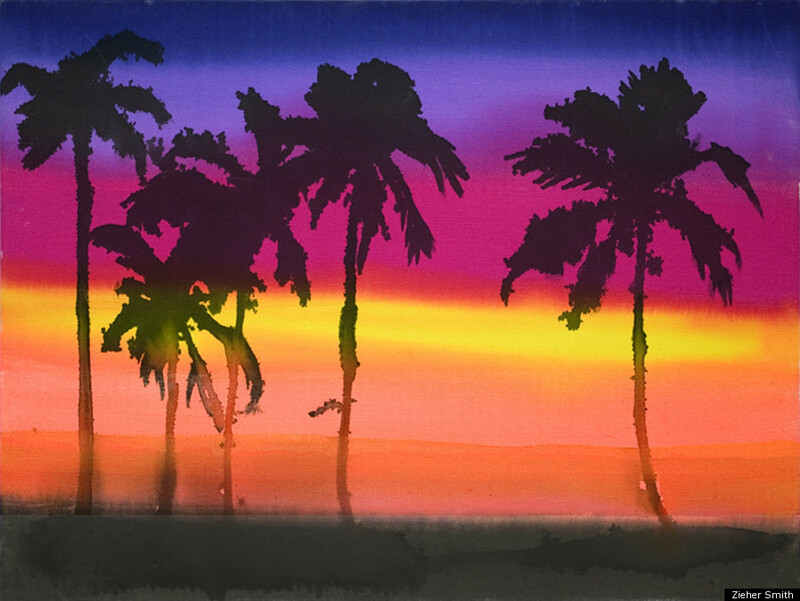 According to the gallery Markus was "inspired by Frederic Church's dramatic 19th century landscapes and the Florida Highwaymen, a self-taught group of African-American artists." The results are towering natural forms which, in their presence, render you powerless, a sensation similar to being in a relationship. Whether placid, windy or rocky, these lovesick landscapes are drenched in passion without the Hallmark kiss of approval. Markus' exhibition will show at Zieher Smith Gallery from February 16 to March 17. Fun Fact: Markus painted all of the works to the soundtrack of Burt Bacharach.